Beauty School Dropout is a photograph by Aimee K Wiles-Banion which was uploaded on July 16th, 2010. 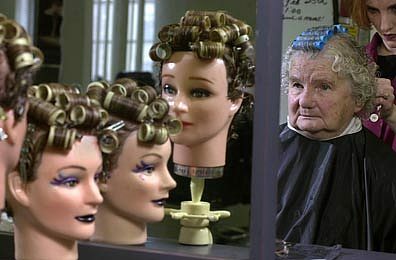 A senior citizen volunteers her hair for student practice at a cosmetology school in Batavia, NY. Photo by Aimee K. Wiles for the Democrat and Chronicle newspaper. There are no comments for Beauty School Dropout. Click here to post the first comment.